Optional: Flavourings of your choice e.g. orange essence, mint extract, lime zest, chilli flakes etc. Place a small pan over medium heat, half fill it with boiling water, then place a medium bowl on top – making sure the base doesn’t touch the surface of the water. Break the chocolate then allow it to melt, stirring occasionally. Line a medium bowl with a clean tea towel or cheesecloth. Add the tofu, bunch up the cloth and squeeze out the excess moisture into the bowl. Add the tofu to a food processor with the maple syrup, vanilla extract, 1 good pinch of sea salt and any extra flavourings, then blitz for 1-2 mins until smooth. Add the melted chocolate and pulse until silky and combined. Divide the mixture into little bowls or espresso cups and refrigerate for 15 mins to chill. 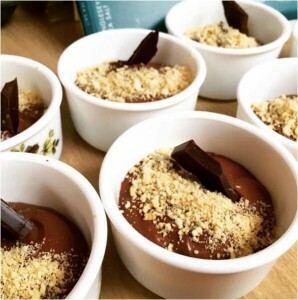 Serve with crumbled golden oreo cookies, lime zest, hazelnuts or any other toppings you’d like.